There is a parking fee of $7.00 at this location. Public restrooms are available (Flush Toilet). To access the free non-motorized carry in launching area, follow Dyckman Avenue to the park entrance along the river, look for the large willow tree on the riverbank. There is no charge for parking in the lot outside the pay gate. 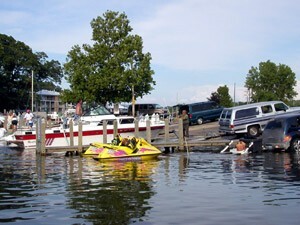 The $7 pay gate is for use of the boat launch ramps.